At California Polytechnic State University, a pair of racial controversies at fraternities have resulted in consequences for everyone in the Greek system, even those uninvolved. 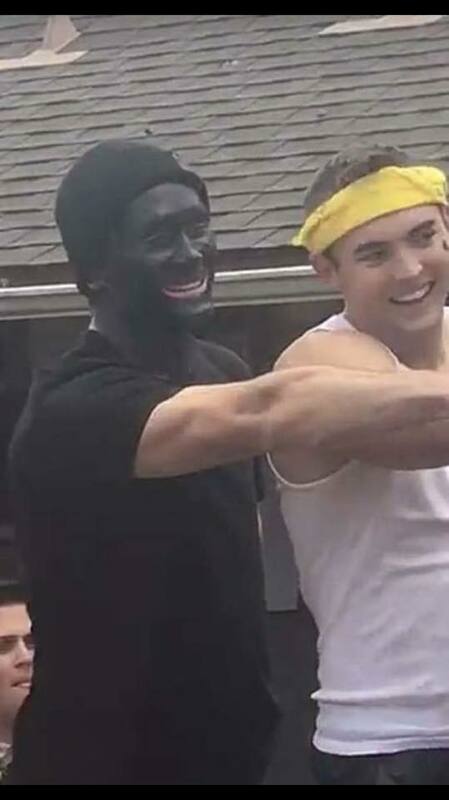 On April 8, a photo was circulated among the Cal Poly community depicting a student and member of the fraternity Lambda Chi Alpha with his face painted black, appearing very similar to blackface-style racial caricatures. Outrage and calls for punishment shortly followed from many members of the Cal Poly community, leading to the suspension of the fraternity by both Cal Poly and the fraternity’s national organization. The student apologized, saying that he was unaware of the history of blackface and its racial connotations, explaining that he was taking part in a team competition in which each team was represented by a different color, and that he painted himself the color of his team. As journalists, what I implore you to think about is free speech. You’re asking me to control what people on this campus think and say. I cannot do that. That is illegal or unconstitutional. The review of the student blackface, the one picture. It wasn’t directed at individuals, it didn’t harass individuals, it didn’t incite violence. And that’s not me saying it, that’s the professionals saying, “That is protected.” People are judging me on that. FIRE wholeheartedly agrees with that statement, and that may have been the end of it if it weren’t for another incident that came to light at Cal Poly shortly afterward. Pictures circulated of members of the Sigma Nu fraternity dressed in outfits associated with racial stereotypes at a party that happened six weeks prior. Sigma Nu’s national headquarters said in a statement that the party was not Sigma Nu-sponsored and that the organization has suspended the members involved while it investigates. Nonetheless, the incident launched another wave of protests, and seemingly in response to the protests, racist fliers and graffiti appeared on Cal Poly’s campus. In the wake of all this, President Armstrong announced the indefinite suspension of all Greek life at Cal Poly. It wasn’t until a week later that we learned the terms of the suspension, which include restrictions on the number of meetings the two sanctioned fraternities mentioned above may hold, and several restrictions on the number and types of events that all other Greek organizations may host. The problems here are legion. Firstly, Cal Poly is a public institution and bound by the First Amendment. As the school itself has acknowledged in the quoted portion, the events that launched this suspension were protected speech, and handing down punitive sanctions on anyone for protected speech is outside Cal Poly’s authority as a state actor. The punishment does not need to rise to the level of expulsion to be a violation of those students’ right to free expression. Secondly, regarding the sanctions themselves, restricting the number of times a group of students may meet in a week is in most instances an abridgment of freedom of assembly. Placing sanctions on students based entirely upon being a member of a group is a clear violation of those students’ freedom of association. Finally, sanctioning students who had nothing to do with the events in question raises the issue of guilt by association and is an affront to basic fairness. Cal Poly is in a difficult situation right now and almost certainly receiving a mountain of pressure to punish students for speech and actions that many see as heinous. Navigating these waters under such public scrutiny is difficult, but the solution is not to create a cluster of rights violations. Cal Poly should do the right (and legal) thing and overturn these sanctions. CORRECTION (11:16 a.m. ET): This story has been updated to reflect that the university has not issued direct sanctions against Sigma Nu. It also now includes information from a Sigma Nu headquarters statement addressing the Cal Poly photograph incident.